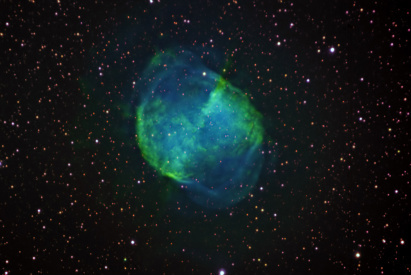 M27 taken with astronomik narrowband filters, R,G,B like SII,Ha,OIII. Exposure time=75,120,115min., all in 5min. subs. Telescope LX200ACF 16", focal length ~2m and Camera SBIG ST-8XME used. All subs. were taken 19. June and 19/20. July-2010.